Starting in October with Halloween trick-or-treat candy, and moving along to the Thanksgiving feast, with Christmas dinner not far away, it’s difficult for adults to make the smart food choices that we know we should make. And if this is difficult for adults, think how difficult it is for children! At Learning Zone preschools in Murfreesboro, TN and preschools in Nashville, TN we introduce children to the benefits of eating veggies through our unique “Seed-To-Table: Vegetable Exploration through Sensory Experience” program. It allows children to explore vegetables and fruits through the senses. Yes! That means we smell, see, touch, hear, and taste them! We even grow them in the garden. The result is that children are much more likely to try veggies. For more information about our food policies and our Gold Sneaker certification, see our Parent Handbook. Our teachers can be an intricate part of teaching children to make healthier choices, but here are some things that you can do at home. Find healthy substitutions for unhealthy traditional foods. 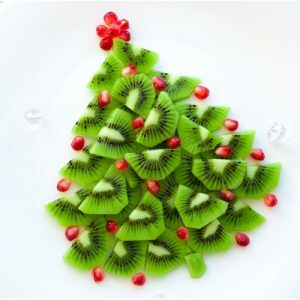 Instead of making that traditional Christmas-tree-shaped cake, serve a Christmas tree made with kiwi. “Do as I say, not as I do” just doesn’t work, does it? Be sure to set a good example. Bettina Elias Siegel,a writer on issues relating to children and food, says thatjunk food producers spend almost $2 billion a year on junk food advertising directed at children. These ads depend on the effectiveness of “pester power” when kids accompany their parents to the grocery store. So, if possible, do your grocery shopping without the kids! Healthy choices in food can be boring. So, make healthy food appealing and fun instead. Enlist your child’s help in the creative process of making food look good. Because they will be more likely to eat their own creations.